Back in October last year we talked about the Chinese stock market, and how reform might make it a good time to buy. It turns out, we were pretty close to the mark, just two months early. The Shanghai market, has started zooming since early December. 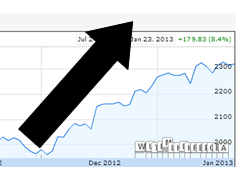 In fact it is up 18% in a month and a half from its low and 10% since we mentioned it in late October. Will it continue? We think yes. How does that compare to other markets? The last few months has been a decent trend for the markets, but the Shanghai exchange has outperformed. Will the Shanghai market keep going? We think it will keep going for a couple of important reasons. Last year confidence in China, particularly amongst Chinese businesmen that we know was pretty low, but that started to turn once the National Congress confirmed the rise of Xi Jinping. It was partly due to his “Southern Tour”, symbolically following in the great reformer, Deng Xiaoping’s footsteps. Partly it was due to conversations we had with well connected friends who have heard rumours of a real timetable for RMB and interest rate liberalisation with solid dates. It could also have been iron ore prices on a rocket ship (up 75% in two months! ), suggesting that many steel makers expect better demand this year. Whatever it was, the confidence indices are showing it too. Confidence sends money. As we mentioned in our previous article, the Chinese government has shown a policy decision to support the market. It has for example lifted the investment quotas for foreign investors and has commented it might lift them even more. You know they must be keen for better conditions when even foreign access is increased.Why? Perhaps the government is keen to get a few more IPOs moving given the reported back-log of 900 plus companies waiting for an IPO. The last time the Chinese market was this low was in the immediate aftermarth of the global financial crisis in late 2008 and early 2009. From there it recovered quickly to 3,500, a nice little 75% gain for those playing at home. China it is? So what do I buy? We usually say, “buy an ETF”. But NOT this time. Why? All China focussed ETFs buy shares of companies listed in the United States or Hong Kong. You’ll get correlation with those markets and not with the Shanghai market. For true China A share market correlation you need a fund that has access to quota to directly invest in the Shanghai market. These are rare for average investors, but we have access to one for our clients. Contact us on admin@caterergoodman.com or (021) 3366 1337 to gain access.